The New York Mets and Toronto Blue Jays played an exhibition game at Olympic Stadium in Montreal last night, the first time the venue has hosted Major League Baseball since the Expos left for Washington, D.C. after the 2004 season. I watched the Toronto broadcast that MLB Network picked up, and was amazed to see how many people came out to support baseball in Montreal. I never made the trip in person, but on television I mostly remember games where it looked like there were more empty seats than people. As far as the game went… at least Jenrry Mejia‘s forearm injury isn’t serious. Hopefully the Mets’ bullpen is getting all of their games like this out of the way in spring training. 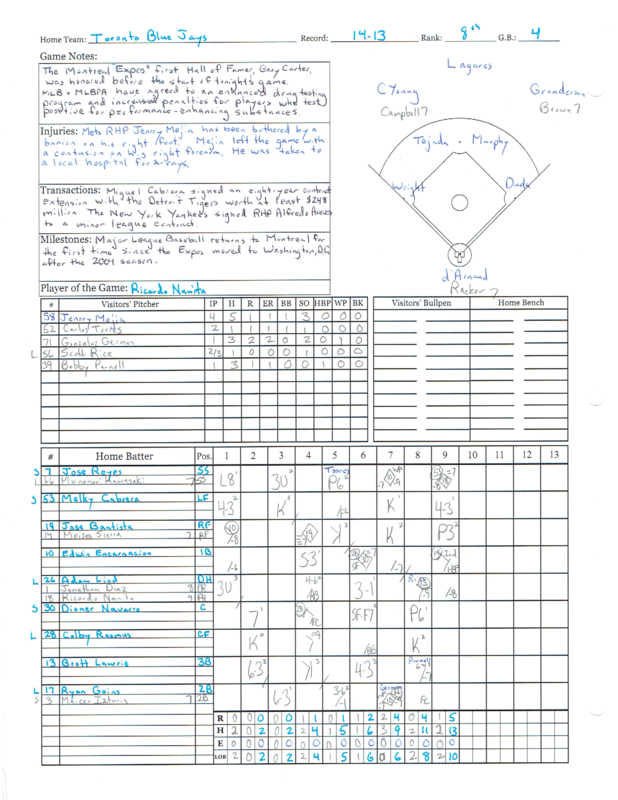 A few years ago, there was a fun blog that posted a scorecard during every day of the MLB season. Sadly, Squaretender no longer seems to be online. 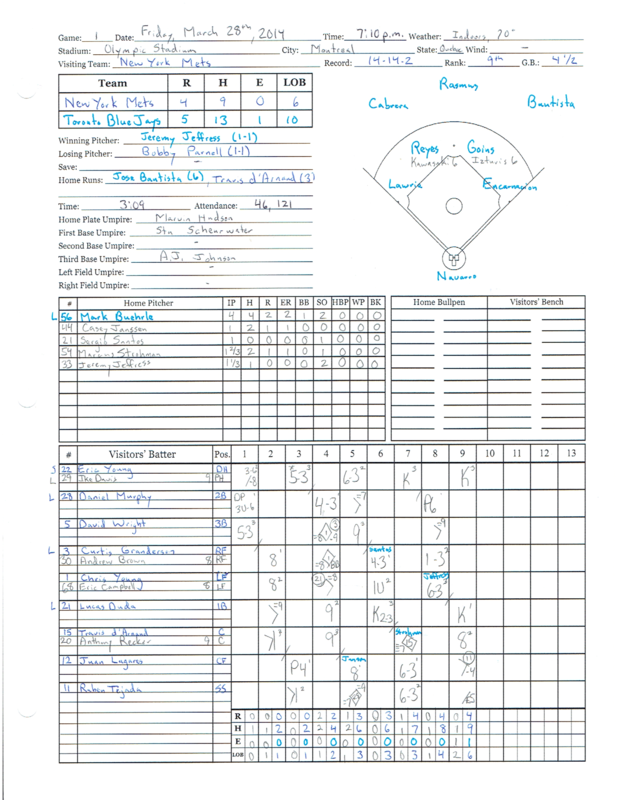 I’m not going to be up to replicating what they did, but will try to keep a scorecard for every game that I do watch and post them here. Just out of curiosity, do you think Danny Murphy will lose at bats to Eric Young this year? Collins seems intent on getting EY’s bat into the lineup, but also wants to have Legaras’s glove out in CF as well. Granderson won’t sit, and Chris Young will be allowed to play as much as possible, given how much they spent on him. So who loses at bats if EY is batting lead-off more often than not? I have the feeling that playing time will find a way of working out. No one ever plans injuries or slumps, but they tend to happen. Eric Young could get at-bats to spell any of the three outfielders or Murphy, and I wouldn’t be shocked if he got exposure at shortstop. I was there the second to last year before the Expos moved. The place, not a beautiful park by any means was, with 50,000 empty seats and a closed upper deck, a tomb. Saw two games vs. the Cardinals as part of a father/son trip that had previous stops in Binghamton and Ottawa. And before each Expos game a 20-minute or so film was shown on the scoreboard that give a sort of winsome look at the early days of Expos baseball. Given that they had one foot out the door at the time, I found the film to be very melancholy. And, given just a few thousand people in the stands, it felt more like a wake than just a few minutes before game time. So, they’ll draw 40,000-plus for each game this weekend? Well, heck, they haven’t played major league ball up there in ten years, so it’s a novelty. Put a team back there and, after the novelty wears off, that 40,000 will be a week’s worth of attendance in short order–like it was before they left.